The Brandalism project is back! 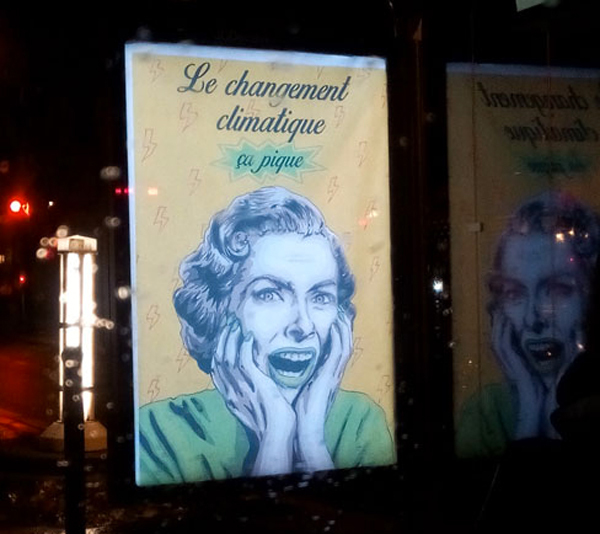 Two days before the launch of the UN COP21 Climate Conference, 600 posters were installed in outdoor media spaces across Paris. 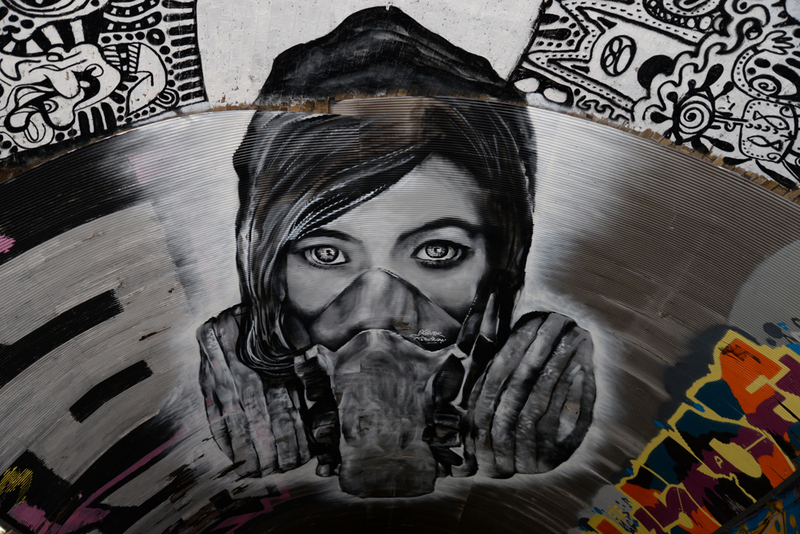 82 Artists from 19 different countries made artworks to challenge the corporate takeover of COP21 and to reveal the connections between advertising, the promotion of consumerism and climate change. 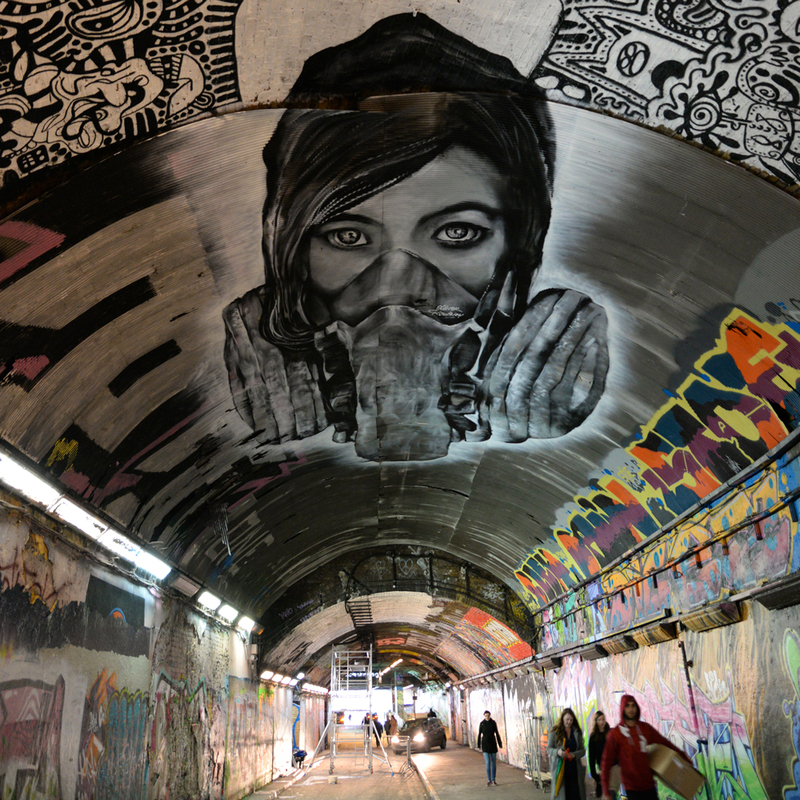 French artist Olivier Roubieu painted this giant 3D portrait on the top of Leake Street, the main legal graffiti area in central London. The artwork is stretched over 6m to give this perfect perspective effect when seen from the ground at one specific point. It is based on a black and white portrait of me taken by Ignacio Isasirri. I flew back to Cyprus as I was invited by St John’s School, a British institution, to do a workshop with their students and paint a mural inside the school. The workshop ran over a week and around 55 children took part in the stencil cutting and painting of a very colourful piece. On my way to St John’s I stopped in Athienou to paint my second mural there with the Katselaproject. When I woke up in the morning, I discovered the terrible events that happened in Paris the night before, strangely the design I was about to paint felt even stronger. The piece features two hands pulling the surface of the building to reveal its inside – a grey brick wall onto which a heart has been painted. The Katselaproject team organised a lot of activities around the live painting such as music, food, martial art performance (…) and it was great to see the community gathering for such a positive and fun day. In Limassol I left my mark high above the ground. I used a lift to spray this piece entitled ‘Jump’, which represents a boy jumping from one window to another. I love how the wall is damaged and tagged, the artwork was meant to fit into the surroundings without destroying them. Dubai is a crazy city, built for cars and fast development, always under construction to extend its megalomania and break new world records. During my trip with Beastie, a stencil artist from Gloucester, we met with the infamous Kiwie for a paint jamm. As it is not possible to paint illegally in Dubai, although official projects are slowly developing, we headed towards Sya and Bow’s headquarter. Kiwie created a punk and cheeky monster while I painted a woman in a sky hijab.